Results Based Advertising to Procurement Executives! 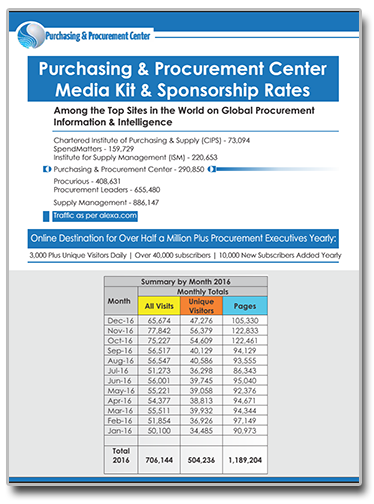 Purchasing & Procurement Center (PPC) is among the top websites in the world attracting over 70,000 procurement & supply chain professionals a month, with an opt-in subscriber base of over 55,000 contacts and growing at close to 10,000 subscribers per year. Our audience is diverse including CPOs, SVPs, GMs, Directors, and other executive levels in procurement and supply chain from large organizations like Fortune 500, or medium and small sized enterprises. Solution providers and consultants can engage with PPC readers in several ways, but ultimately our focus is on the Advertisers success through our results based advertising. While there are many advertising services designed to engage through impression-based digital advertising, few focus on results based advertising with Qualified Lead Generation Strategies, so that you can then actively market to these people who have shown an interest in your services and solutions. To start, first Download the PPC’s Advertising & Media Kit & discover more about our audience, traffic and various results based advertising packages. Unlike other websites focusing on the ‘latest’, PPC content focuses on ‘evergreen’ best practices that are timeless in nature and relevant throughout the working life of a procurement professional. We are marketeers, focusing on results not ‘likes’, ‘views’ or ‘comments’. Despite of how many likes or views you receive if those don’t convert to ‘cold/hard’ leads that you can market today, tomorrow, 6 months and years down the road, they’re all worthless. We can quote ‘Research after Research’ that indicate that only a minor (single digit) percentage of all initial visitors are in the market to buy a solution or service, but you already know that. That’s why our focus is in attracting qualified visitors with quality content based on their interest first - then only start marketing to them with an expert and authoritative voice that will warm people up to your services and solutions. What that means for you, is that whether you advertise through articles, whitepapers, webinars, videos-on-demand or other content formats, your content will be continuously attracting traffic and leads now, 5 years and 10 years down the road. Every individual follows his path to buying. You can influence that path so that when the right opportunity comes, your solution and services are at ‘top of the mind’ of your prospective clients. And that’s what we do, keep you at ‘top of the mind’ of your prospective clients. Converting that Traffic to Qualified Leads. Update your contact details below to download the Advertising & Media Kit & find out about our audience, traffic and various results based advertising packages.